I love the bag & the scarf! i have that bag in pink. love the red!! I love the mix of blues with the pop of orange! I love the ankle boots + dress combo too, and it's one I'm excited to wear now that it's fall here. What a fun bag too, I love the pop of color it adds! Both dresses look great on you! I like your layering in the first one, although I find different shades of blue really tricky to mix. Poor little Cooper! I hope his paw is okay. both of these dresses are lovely. I think that striped dress look is my fav, probably because I love striped so much and that dress looks so comfy and cozy. No wonder you didn't need the scarf, but I must say that the scarf is such a lovely accessory for this dress, keep it in mind for when the time gets cold again. and it is also a perfect dress to wear on its own when it is warm! Loving the second look SO much, and the appearance by your dog, super cute haha. 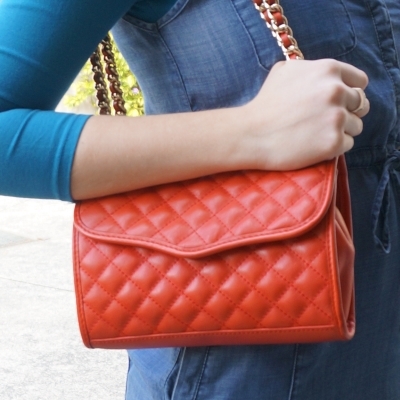 Your red quilted bag is perfection! Great accessory for Fall! I love your chambray dress, it is so pretty! I love your ankle boots + dress outfits! Those tan ankle boots are awesome! What an amazing bag! It compliments both of your outfits perfectly and adds just the right amount of color! What a cute little clutch. Love your full scarf and your chambray dress. Love your last look, Mica! The scarf accomply all colors of your outfit. Both dresses are perfect for the warming weather. Have a great weekend, Mica! Love both of these dresses and how you accessorized them- making both PERFECT for fall! Love those ankle boots and Cooper is such a wannabe dog model, look how he always gets in on the action! haha, he is such a little poser! Still not going to make him his own instagram though ;) He'd become too much of a poser then! Thanks! It's more red than orange but orange would look great too with blue! I'm a dress/ankle boots fan too. Just waiting for the weather to warm up more in Sydney so I can wear them! Its like winter is back lately! Yes what's up with the weather?! It's the same in Brisbane. We had lovely spring temps and then boom back down to single digits. Very weird. Seriously love the dress/ankle boot combo for fall! I love it when we can start wearing spring outfits again. Your bag is so gorgeous, what a gorgeous colour. The scarf is a real stand out also. Those dresses are so cute! I especially love the first one. That Rebecca Minkoff mini quilted affair bag in fire engine red is simply awesome, I just might have to pick it up:))))))))) You look so sweet and chic there, nice choice! He's doing much better now thank you, back to his usual, happy, non-limping self! Lovin the scarfs as always babe! I love ankle boots with a dress! Your red bag is so great. I have one of those in a different color, and it's a favorite of mine. Glad to hear Cooper is better. Ankle boots with dresses make such a great pairing. And these two combos are lovely especially with the scarf in the second one. I can only wonder how your house hunting is coming along . House hunting is coming along slowly, haha! It's difficult finding the perfect place! Is it just me or has your hair grown back super fast after you had it cut? I'm so jealous! I was actually just thinking that the other day, ha! It does seem to have grown back quick! Due another trim soon! Aw, and poor Cooper...hope he's doing better! Yayyy.. love the outfits! 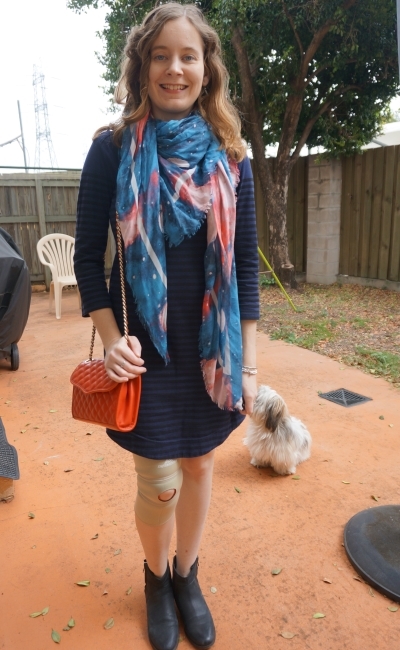 But as usual, your bag is what I always look at first, Mica hihi..
Hope your knees will totally get better soon! I always love blue & orange together! It looks so good paired up. Beautiful outfits. I like these transitional outfits! Dresses and booties are such a great combo!